Contemporary Country Estate: This is the stylish country inspired ocean view home you have dreamed of. Sophisticated, charming and beautifully finished.Extensively remodeled 2010. The garden setting is extraordinary: Beautiful rose and flower gardens, stone walls, spacious wrap around ocean and island view dining deck, kitchen BBQ patio, outdoor shower. 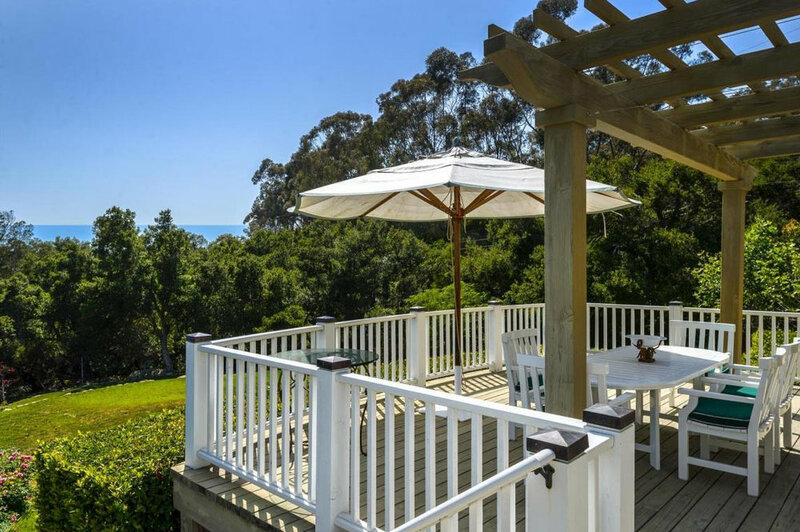 A huge wrap around ocean and island view deck is the “largest room in the house”. Central to the public rooms is an extraordinary spiral staircase with wooden railing and open landing. The formal dining room and adjacent family room, both with walls of windows and French doors, share a unique open wall design, which celebrates the light and views the dramatic clearstory windows provide. The remodeled French country kitchen, complete with Viking appliances, marble counters, a large island, and custom cabinetry including an amazing built-in breakfast bar, opens to a barbeque terrace.